"Trends that will shape the future of retail industry"
The future of retail is bigger than flashy new technologies or the hyper-connected Internet of Things. The retail paradigm has shifted from a single physical connection point with customers to a multi-pronged approach that crosses both physical and digital channels. What is the significant impact on the retail industry when inventory and supply chain automation is being transitioned into the cloud? What are the trends that will shape the future of retail industry? What gives smaller retailers the ability to compete with larger retailers? What are the things organizations need to know about the future of retail? 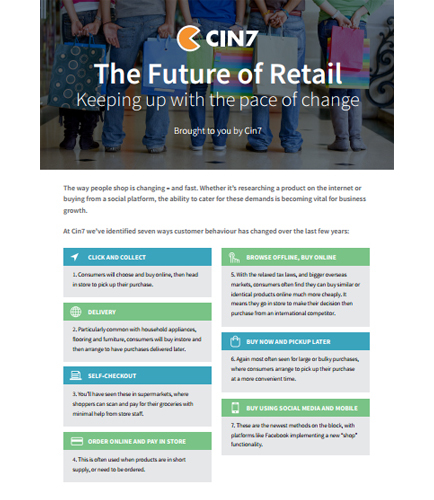 Read this whitepaper to gain unique insights into the future of retail. Although ecommerce is now a relatively mature industry, the software solutions that form the basis for the industry are still very much evolving. So, if you’re in the process of selecting personalization software where should you begin and what questions should you ask? This whitepaper offers some simple advices to help you through the process so that you can select the personalization software that best meets your needs and budget. Key questions for evaluating your personalization software: Have you sense-checked your requirements and selection criteria with a third-party? Where you sit on the maturity curve has implications on how you should conduct the selection process? If you find yourself revising your scorecard during the selection process, can you fairly apply the new criteria to all prospects, or do you need to restart the process? Have you identified reference clients who have similar requirements of software to your own?